Volunteer Services (formerly Volunteer Chore Services) began in 1981 in response to cuts in services for elders by the state legislature. The program currently works with thousands of elders and adults with disabilities statewide. VS is committed to helping elders and adults with disabilities remain independent in their own homes through a network of caring community members. The services are provided at no charge and serve as a safety net for those individuals who cannot afford to pay for assistance and do not qualify for other assistance. Volunteers generally provide 2-8 hours per month assisting their neighbors depending on their schedules and availability. adults, age 18 – 59, who have temporary or permanent functional limitations. VS does not have strict financial criteria – its purpose is to serve as a safety net for those who do not qualify for other services and cannot afford to pay for services themselves. All services are provided free of charge and are based on the availability of volunteers. All volunteers are carefully screened with three references and a Washington State Patrol background check. Click on the tabs to locate the office nearest you to request services or further information. Through a network of caring volunteers, the Lifespan Respite Care Program at Catholic Community Services offers assistance to low-income persons who are caring for a family member with a chronic illness, disability or the frailties of old age. Relatives raising children are included. Include caregivers who may call directly and request assistance, community organizations, Area Agency on Aging (AAA) Family Caregiver Support Program Specialists, Kinship Navigator Programs and AAA or Aging & Disability Services Home and Community Services or Developmental Disability case managers. Includes assistance with housework, laundry, yard care, transportation assistance, shopping and minor home repair. A staff member will talk with you to gather information regarding your specific needs and the needs of the family member to whom you are providing care. A Volunteer Coordinator will visit you in the home where Caregiving is provided to share further information about the Program, gather more specific information about assistance to be provided and to discuss scheduling. A trained volunteer will be matched with you to provide direct assistance that meets your needs. The wait for a volunteer may vary depending on availability, geographic location and type of chore request. Your Volunteer Coordinator will phone you to follow up once a match has been made; we want to make sure that your needs are met and that the volunteer assignment is positive. If you have ongoing services, your Coordinator will check in to see how the match is progressing and to ensure that needs are being met. 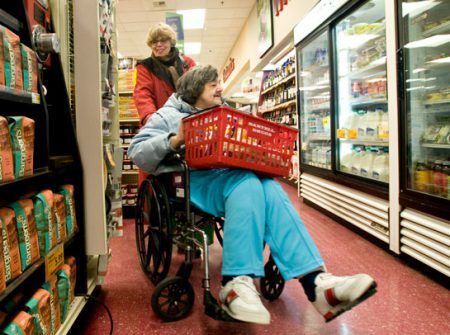 Your assistance enables elders and adults with disabilities to remain independent in their own home. Our volunteers lead full lives and enjoy the chance to connect with someone and help out in a meaningful way. Volunteers may help the same person each week or be listed for on-call assistance depending on their schedules and interests. Most requests are for assistance with shopping, light housekeeping, laundry, cooking, and yard work. Volunteers receive training, mileage reimbursement and insurance to assist them in their volunteer commitment. Our volunteers come from all age groups: families and couples volunteer together as well as students and retirees volunteering independently. Youth under 16 years of age must be accompanied by an adult. VS also collaborates with faith-based congregations, civic groups, schools and community businesses to provide services. Volunteer Services has a number of opportunities for groups of all sizes to provide services to eligible clients. Group projects are an excellent way to provide a one-time taste of volunteer service for a youth group, community group or corporate team. Groups contribute their skills in painting, home clean-up, minor home repair, moving or yard work. Locate the office nearest you to find out how your group can get involved. You can start the volunteer registration process now! If you live in Western Washington, click on the tabs above for the office nearest you to download an application or request information be sent to you. The application requires three personal references, completing a Washington State Patrol background check and a disclosure form due to the vulnerable population served by VS. Follow information on that page for submitting the forms.